I have just finished this top, ready to send to the long armer. The words forming the border are Block Lotto blocks from the “Terms of Endearment” blocks circa February 2011, which I was lucky to win. Thanks to all who made one or more of these blocks. They’re amazing. The heart in the center is a pattern from Michelle Watts, a quilt designer who lives in New Mexico. 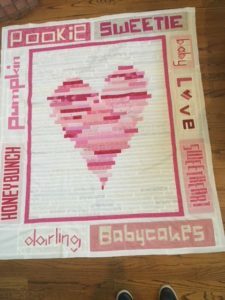 This quilt will become part of my grandmother “baby hope chest.” Both our kids are hoping to begin a family soon, so this one will go to the first granddaughter. I will be adding an applique heart in the lower left corner, and will embroider the girl’s name when known! What a beautiful quilt. It’s sure to be a treasured family heirloom! I love this quilt! Makes me want to make one too…..but I’ve already have a baby girl quilt in the hope chest. Thanks for the inspiration!